UPDATE: This post has been changed since it was first published. Video of the crash scene has been added. 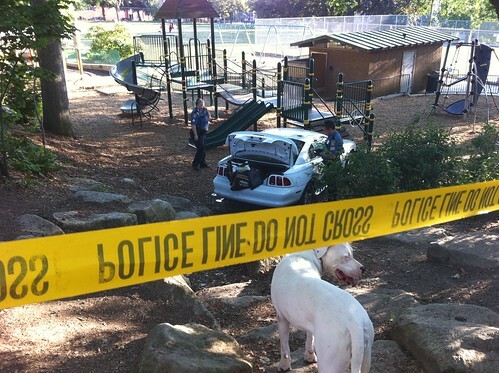 A high-speed chase across Capitol Hill ended around 6:45 p.m. this evening when a vehicle crashed into the northwest corner of the playground at Rogers Playfield. 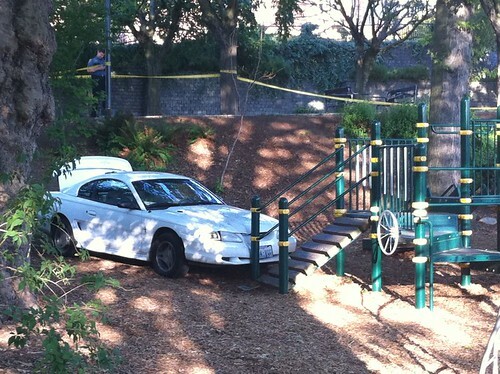 Amazingly, there apparently was no one on the piece of playground equipment the car came to rest against. No one was injured. The suspect in the chase was caught shortly after the crash. Our affiliate news source, Capitol Hill Seattle, reports that the chase began at Bellevue and Pike after officers stopped the car’s driver. 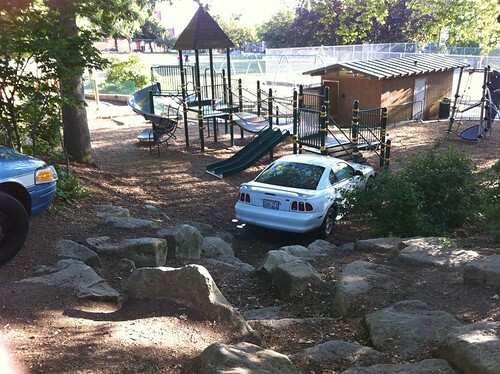 The car, followed by half a dozen police cars, raced down 10th, then west on Roanoke over I-5 before the car jumped the sidewalk, went down a rocky embankment and landed next to the playground equipment. Witnesses said the suspect fled the car and started across Rogers Playfield before doubling back. Officers captured him a short time later. According to East Precinct radio transmissions, the missing person investigation involves a woman reported missing to the Washougal police department a few days ago. When he was pulled over, the suspect told police he had just received the car from the woman but a plate check revealed that plates from another vehicle had been swapped onto the car. The suspect sped away east on Pike at 6:44 PM before heading up 15th Ave. In fact, the plate on the front of the vehicle didn’t match that on the back. Police quickled cordoned off the area and searched the vehicle, removing some items. 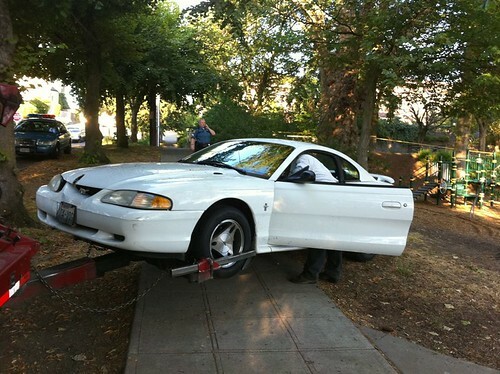 Tow truck drivers maneuvered the vehicle out between playground equipment and several large trees about 7:45 p.m. and towed it away, with several police cars following close behind. 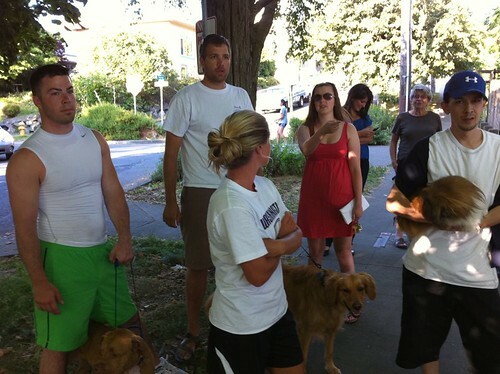 Thanks to Justin at Capitol Hill Seattle for sharing his reporting on this story. This entry was posted in Uncategorized on July 27, 2010 by cdmilton. Thanks Curt! I was watching from Louisas. I’m so glad no one was hurt! Thanks for the report–I wondered what happened. I heard the sirens and when I stepped out on my front porch to see what was going on, I saw 4 police cars in front of my house and was immediately told, “GET IN YOUR HOUSE AND LOCK YOUR DOORS!” I complied! I later learned that the suspect had run down Edgar, ran through my yard, and hopped a fence between my house and my next door neighbor’s house, tearing through thick bird netting. That homeowner confronted the suspect who then hopped another fence and was eventually caught by police in the townhouse courtyard behind me. Throughout the entire time of the suspect running and fence hopping in my yard, my front door was wide open, since it was a warm evening. It would have been so easy for the him to simply run into my house. I feel so very lucky. I’ve been looking for a news story on this since it happened. 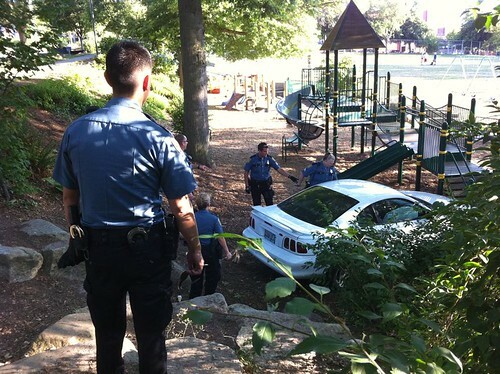 I saw the Mustang go into the park, followed by the police car. Then I saw the suspect running away on foot while sitting in my car at Roanoke and Eastlake. Police cars came from every direction–it was crazy!